Winston Churchill as First Lord of the Admiralty Entering Admiralty House, September 1939. Through the mid to late 1930s, Churchill was a lone voice warning that Britain was ill-prepared to meet the threat of the ever growing military machine in Germany under the direction and guidance of Adolph Hitler and his leaders of the Nazi Party now in control of Germany. Churchill had been out of government office since 1929, although he still held a Parliamentary seat. The British government under Prime Minister Neville Chamberlain in 1938 was inclined to adopt a policy of isolationism and appeasement towards Germany, not wanting to provoke Hitler. As Germany's annexation of territory within central Europe continued to expand, so did the public demand to have Churchill returned to a government position. Chamberlain resisted the call for Churchill believing Churchill's presence in the Cabinet would be counter-productive to efforts for appeasing Hitler. Chamberlain's adamancy in this regard was interpreted correctly as a sign that appeasement was not to be abandoned and that any gesture of resistance towards Hitler's annexation policy was all bluff. Britain and France had provided reassurance to Poland that if Poland were attacked, both would come to her aid. On September 1, 1939, Germany invaded Poland. As a consequence, Chamberlain invited Churchill to join the War Cabinet as First Lord of the Admiralty. Chamberlain broadcast to the citizens of Great Britain the morning of September 3 that England was now at war with Germany. The Board of Admiralty on hearing of Churchill's appointment signaled to all ships and naval bases: "WINSTON IS BACK." 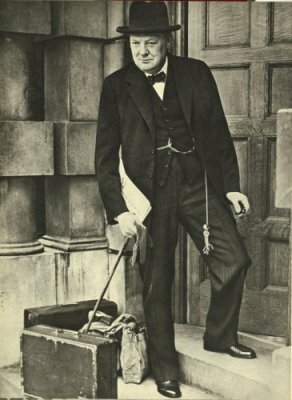 Churchill was to reassume the cabinet post he had held almost a quarter of a century previously. Churchill (age 64) settled into his former office in Admiralty House on September 4, 1939; there he found the very same sea maps showing the disposition of ships he had used when he left the Admiralty in 1915. Eight months later, in May 1940, Churchill would replace Chamberlain as the wartime Prime Minister of Great Britain.